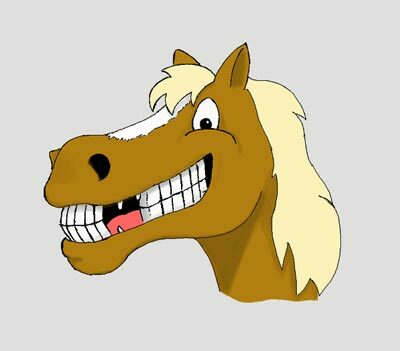 A normal adult horse has from 36-44 teeth. Why the variation? Well, that number includes some teeth that are "optional" - specifically, the canines and wolf teeth. Refer to the chart below to see a more detailed description of the different types of teeth in a horse's mouth. Now the most important job for all those teeth is, as you might guess, to process food material. Eating is a vital activity for a horse, and they spend a lot of time doing it. Their digestive tracts are designed to handle large amounts of food, but spread out over an extended period of time. In some studies, horses have been observed to graze for 16-18 hours out of the day. Considering how important eating is to them, and the amount of time they spend doing it, the condition of a horse's mouth is vital. A horse with diseased, damaged, or painful teeth is going to be frustrated or unable to eat in a normal manner, which will consequently affect their emotional and physical well-being. Horse teeth have some special characteristics that make them different from a human's teeth. You may have heard that a horse's teeth grow continuously. This is not exactly true, but they do seem to do that. In actuality, a horse's permanent teeth are fully formed in the first few years of life, but most of the tooth is below the gum line. As the horse eats, the chewing surface of the tooth gets worn away (like a grinding stone), and the "reserve crown" slowly emerges (erupts) from below the gum line to take its place. In this process, the tooth is not truly growing, in the sense that new tooth is being formed, but is continuously erupting. The tooth will erupt until all of the reserve crown below the gum line is exhausted. For most horses, this is usually around 20-25 years of age. To see a video of this process, click "play" on the cutaway image of a horse's molar to the left. As a side-effect of the normal chewing process, horses develop sharp edges and points on the sides of their cheek teeth. These areas can be quite painful, and can even cause ulcers or cuts on the cheeks and tongue, resulting in a very unhappy mouth. Imagine trying to chew with a mouth full of thumb tacks, and you'll get the picture. Do you know what's going on inside your horse's mouth? Most people don't, and they really shouldn't feel guilty about that. For most horses, their mouths are personal space, and they are not usually thrilled with someone poking around in there. Horses, as a species, are very secretive about what's going on in their mouths. They often will not exhibit any noticeable symptoms of dental disease or mouth pain, so the only way to really know what's going on inside is to have a thorough dental exam done. Regular dental exams and treatments will identify existing problems so they can be treated and help prevent future problems. Easily the most common equine dental procedure is floating. It involves the use of a specialized file to remove sharp edges and points that form on the sides of the horse's teeth as a result of their normal chewing action. Now, the thought of someone filing on your teeth may have you a little concerned, but remember, a horse's teeth are made a little differently. With normal chewing, the surface of the tooth is constantly being worn away, leaving sharp edges and points on the sides of the cheek teeth. Routine floating removes those sharp places, leaving a smooth, beveled edge. Since sharp points are continuously forming due to the chewing process, floating should be done on a regular basis to keep the horse comfortable. A complete dental care program does not stop with floating, however. In doing a thorough dental exam, other abnormal conditions of the mouth can be identified and treated. Periodontal disease, fractured or otherwise damaged teeth, abnormal alignments or overgrowths (often called malocclusions), and even cavities are all problems that can affect the horse's overall oral health and comfort. As is usually the case, early detection and treatment are key in promoting the best outcome, so those regular dental exams are very important. In general, adult horses should have dentals on a yearly basis to maintain optimal oral health and comfort. In some cases, more frequent exams and treatments may be necessary. The chart below outlines a recommended schedule for dental exams. Birth Exam Although foals are rarely born with any erupted teeth, an examination of the mouth for abnormalities should be part of a routine foal check. 6 Months Exam Often at this age, foals are getting their first series of vaccinations. It is a good time to examine the mouth again for any abnormalities and to make sure the deciduous (baby) teeth are erupting in a normal fashion. 1 Year Exam/Brief Float Yearlings rarely need extensive work done on their mouths, but a brief float to remove sharp points will make the horse more comfortable, and might increase their appetite. every 6-8 months It is recommended that horses of this age have exams done every 6-8 months. This is the period of a horse's life when their mouths are changing the most, and dental exams are very important during this stage. Deciduous teeth are shedding; permanent teeth are erupting; and many horses have a bit in their mouth for the first time. This is also the time during a horse's life that problems such as wave mouth and hooks start to form. Identifying these tendencies early is the best way to prevent these conditions from being a major problem for the horse later in life. 5+ Years Yearly Exam/Float Dental exams should be done at least on a yearly basis. After five years, a horse's mouth is considered to be mature, in the sense that all the teeth are permanent. If routine exams have been done up to this point, abnormalities such as wave mouth or hooks should be minimal and easily corrected and maintained. Occasional Floating In older horses, those sharp edges and points that often cause such discomfort at younger ages usually become less of a problem. Most of this is due to the fact that the teeth, at some point, run out of reserve crown, and eruption slows. Any floating done is mostly sporadic to smooth over the occasional sharp projection or overgrowth. Other problems, such as periodontal disease, often become the primary concern in geriatric horses. 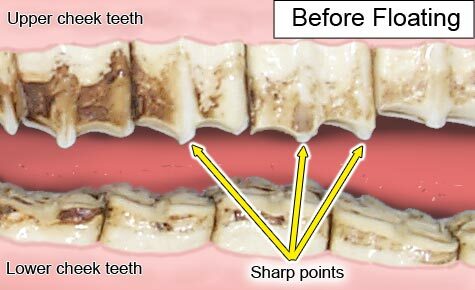 Expired and diseased teeth will sometimes need to be removed. In some cases, a change to a specialized diet will help these horses maintain their weight and health. Outwardly, it is very difficult to determine whether or not a horse has dental disease or needs routine work done, such as floating. Ideally, a horse owner should stick to a regular schedule for dental exams and treatments. Having routine exams and treatments done will keep your horse's teeth comfortable, and as healthy as they can be. The chart above is a good reference, but should be tailored to your horse's individual needs.